A handful of you might remember that not all that long ago, Sonia and I had been living without a microwave. We purposely neglected to replace it mainly to see how we’d do without it. But now that we’re living in our RV and traveling, we are now, once again, endowed with the ability to irradiate our foods from frozen to ready-to-eat in a matter of minutes—when we’re hooked up to shore power, at least. Oh, how I’ve missed you, nuked foods. May our romance blossom once again. For our reunion date, you prepared a delish fish dish for me. How sweet of you, Samsung MC1015BB. This blog has explored quite a few different frozen, microwavable Indian products over the years. In my opinion, this is one of, if not the most consistent line of products Trader Joe’s has to offer. No, they can’t compete with a really good, authentic Indian restaurant, but considering the price and convenience, I’ve never found anything that compares. This dish was no different. It’s the same basmati rice we’ve been seeing with most of these Indian meals. And of course, TJ’s curry is pretty consistently good. And the fish? Well, that was the wild card. Some TJ’s fish is spot on, and some…not so much. But here we had a delicious white fish with a great taste and texture. Swai? 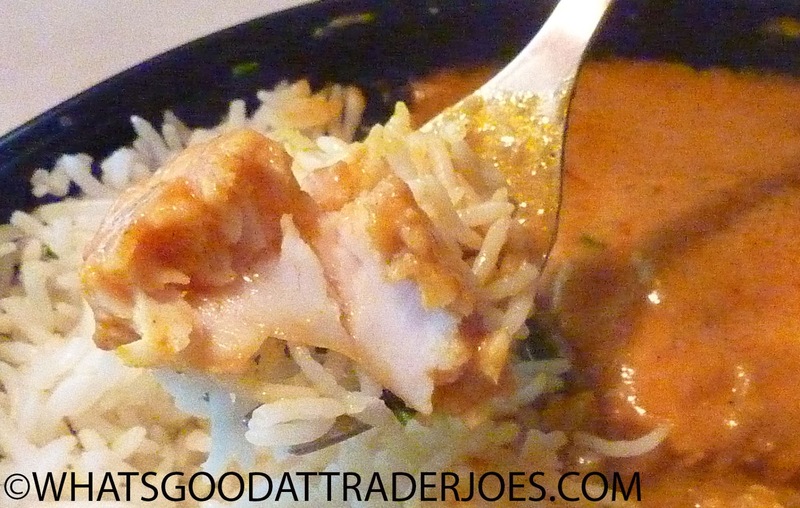 It was soft, but not mushy, and it blended quite well with the thick, spicy curry. The packaging made the fish look like two or three “sticks,” for lack of a better term, but we got a large, triangular filet instead. 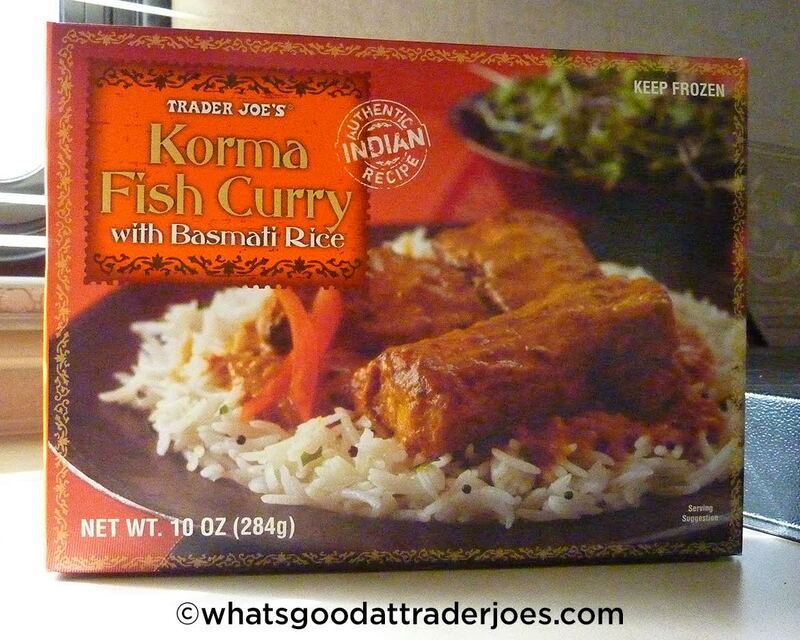 If anything, it was more fish than I expected, just based on the picture on the box. There’s a surprising amount of heat here, too, which Sonia and I both appreciated. 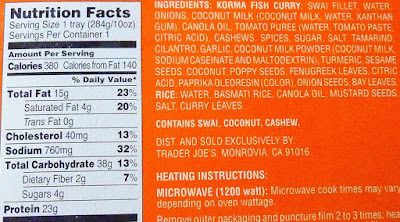 The curry is potent, yet sweet, smooth, and coconutty. All three elements worked beautifully together, and we devoured our entrees quickly, wishing we had purchased another box or two to enjoy another day. At $3.49 per single-serving package, it’s one of the pricier microwaveable Indian products at TJ’s, but it’s worth it if you ask Sonia or I. Four stars a piece. Honestly they need to bottle the tikka masala sauce ALONE. Exact same recipe that they use in the frozen meals. Love the frozen Indian meals though! This blew my mind w how good it was! I was really surprised at how good it was for a frozen Indian meal. The curry was well balanced and the fish (although it was swai) still managed to be prepared perfectly considering it was frozen and stored in a sauce. Paired it with some of TJ's garlic naan for a quick dinner and it turned out very well. Huh! I bought 2 of these, ate one and hated it, and the other has sat in the freezer for months. At least now I'm motivated to give the other one a try. I loved this TJ entree, but was curious to find out what swai is. I went a-clicking on research articles and pros/cons of swai which is Vietnamese cat fish. It appears there's been a sort of fish war on, with US fish catfish producers maligning their Vietnamese competitors. IMO the Vietnamese swai is a better product, has a lighter flavor and is less fatty than US catfish. Its also much cheaper. 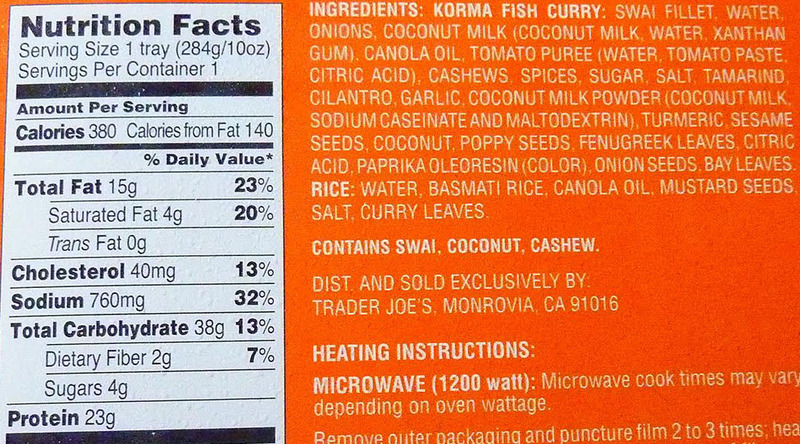 US fish producers' aim is to put US consumers off farmed swai by saying it's a bottom feeder raised in sewage infested waters, contains mercury, among other savory bits of info. Can anyone give an unbiased, fact based response here? Is it safe to consume swai or not?